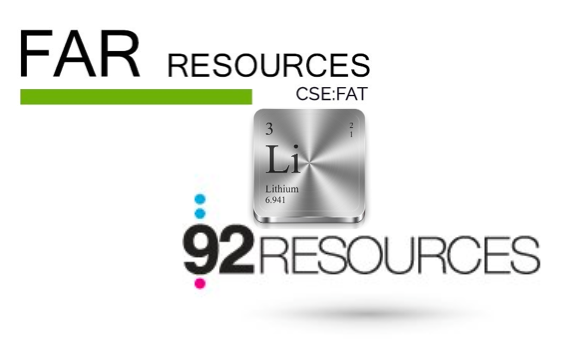 With yesterday’s announcement of Far Resources (CSE: FAT) (OTC: FRRSF) set to acquire a 90% stake in the Hidden Lake Project which is owned and operated by 92 Resources (TSX-V: NTY), we believe this investment has set the stage for Far Resources to be named one of Canada’s top tier lithium companies. The Hidden lake project consists of 5 adjoining mineral claims with high-grade lithium and is situated approximately 40 km east of Yellowknife and spans over 1,659 hectares within the Yellowknife Lithium Pegmatite Belt. A recent exploration conducted by 92 Resources in 2016 resulted in samples of 1.9% Li20 and up to 3.3% Li20 and processed 400 kilograms of pegmatite through a dense media separation which returned in 40 Kilograms of high-grade spodumene concentrate with an average of 6.11% Li20. Shareholders of Far Resources should be pleased to know that the new Hidden Lake property is road accessible for transportation and has the infrastructure in place for further expansion and extraction which is critical for the success of any mine. Additionally, the Zoro 1 property also has the necessary key infrastructures in place to deliver the minerals to market! The importance of infrastructure and transportation was described in a previous interview with Keith Anderson CEO of Far Resources. In the interview, Mr. Anderson stated “But one thing I would like to throw in, is the most important aspect for any junior company that is INFRASTRUCTURE INFRASTRUTURE, INFRASTRUCTURE. If you don’t have infrastructure around your project, in other words if there is no road or rail, or power or water, you can have the best project in the world it won’t matter”. We can see that that Mr. Anderson is securing another valuable property for shareholders with infrastructure and transportation in place. Far Resources currently has 7 High-grade pegmatite Dykes in the historical Zoro 1 property located in Snowlake, Manitoba, a Memorandum of Understanding (MOU) with Nova Minerals (ASX: NVA) in the prestigious Thompson Brothers property located adjacent to the Zoro 1 property and now a possible stake on 5 land claims at the Hidden Lake property from 92 Resources containing extremely high-grades of spoudemene concentrate. The developments and investments in these properties will deliver significant value for shareholders as the company continues to explore and extract high-grade lithium in the near term. Looking at the expertise and track record of management is very important for investing as this dictates the delivery and execution needed to deliver significant returns for investors. If we start with the President of Far Resources Mr. Keith Anderson, we know that he is very talented in structuring the right deal to create value as he was the Vice-President and registered representative of Canaccord Capital Corp. which today is known as Canaccord Genuity (TSX: CF) a leading independent, full-service financial services firm with a focus on wealth management and capital markets. Investors must also note Mr. Jared Lazerson who sits on the advisory board and also the newly appointed Board Member Mr. Toby Mayo. Mr. Lazerson has started his career in the mining and technology sector since 1994 and is the Chief Executive Officer of MGX Minerals (CSE: XMG) a market cap of approximately $140 Million and has developed MGX Minerals into one of the largest mineral companies in western Canada. Another important addition to the management team was the recent appointed board Member Mr. Toby Mayo. Mr. Mayo started his career as an exploration geologist with one the worlds most renowned mining company Rio Tinto (NYSE: RIO) which has a market cap of $91.44 Billion. Mr. Mayo was also a consultant and a Senior Technical Advisor of a Canadian mineral and exploration company called Ivanhoe Mines Ltd. (TSE: IVN) which has a market cap of $3.29 Billion. In our conclusion, not only does Far Resources have significant partnerships and high grade lithium properties in place, the company also has a very accomplished management team with the experience and connections to position Far Resources amongst the likes of Critical Elements (TSX-V: CRE) and Nemaska Lithium Inc . (TSX: NMX) and we believe that Far Resources has all the pieces in place to be one of Canada’s most Top tiered lithium companies.